Radiant cut solitaire diamond pendants are especially vibrant because the extra facets disperse more light throughout these geometric shaped diamonds. Radiant cut diamonds make wonderful gifts or any occasion. At CaratsDirect2U we have a large stock of 0.50 to 2.50 carat radiant cut diamond available. These stones range from VVS1 to I2 in clarity and D to K in color. 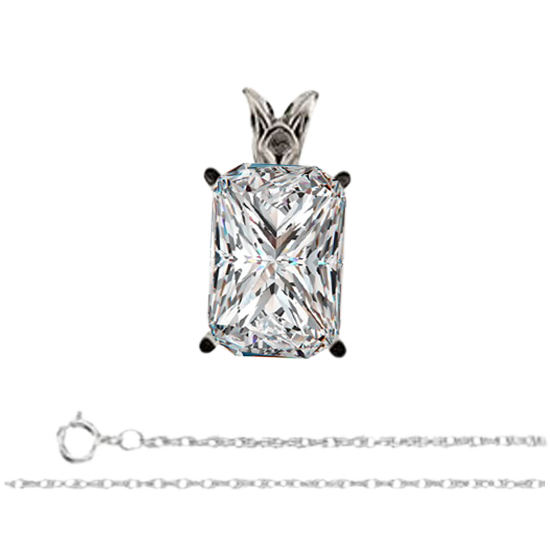 The available lengths of the box style chain for our radiant cut diamond necklaces are 16, 18, and 20 inches. The radiant diamonds are set in four-pronged white gold. We also offer reasonable priced clarity enhanced and laser drilled radiant cut diamonds, allowing you to buy a larger diamond that cost less than a non-enhanced diamond.